So long, Authority — there’s another baddie in town. True Blood has cast a sinister new figure for Season 6. He’ll be played by a familiar face who happens to be a sci-fi icon. Every season, True Blood brings on a new villain. Whether it’s witches, wolves or the arrogant Authority, someone’s constantly terrorizing Bon Temps. So who’ll stir the pot next year? 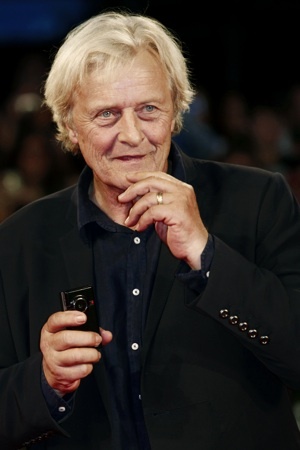 It’s been confirmed that veteran actor Rutger Hauer is the new big bad. According to TVLine, the actor will play “Macklyn, a mysterious and sinister figure with deep ties to Sookie and Jason.” Since he’s specific to the Stackhouse siblings, we wonder if he’s really Warlow? It’s interesting they describe Macklyn as a “figure” considering Warlow often appears as a semi-transparent entity. Coincidence? We think not. Hauer will be billed a series regular, a status that usually gives us joy. Unfortunately, it means nothing in the world of True Blood. [Spoiler alert] Christopher Meloni received the same treatment during Season 5, and was promptly killed off halfway through its run. Who knows how long Hauer will stick around? The actor is best known for his starring role in the sci-fi classic Blade Runner. In the film, he played a robot called Roy Batty who butts heads with Harrison Ford‘s Rick Deckard. Ironically, he also played a vampire in 1992’s Buffy the Vampire Slayer alongside Kristy Swanson. He’s no stranger to the ways of the bloodsucker. In recent years, he’s appeared in Alias, Sin City and Batman Begins. True Blood returns to HBO in June 2013. What do you think of Hauer as the villain of choice?